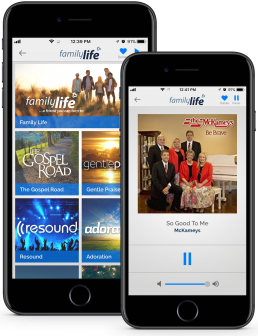 Family Life gives you 24/7 access to Christian music streams — listen to Gentle Praise, Resound, The Gospel Road, and the "AC" format station. Plus get the latest podcasts, daily verses, and events. People depend upon community and community-events to strengthen relationships and build new ones, share social ideas and thoughts, interact with like-minded individuals and address common issues affecting community members. Christian communities offer a platform for Christians to uphold their faith in God and at the same time strive to celebrate the rich diversity of the Christian culture promoting justice, peace and solidarity. Family Life is the largest Christian radio network, simulcasting radio shows from 70+ stations across Western and Central New York as well as northern Pennsylvania. 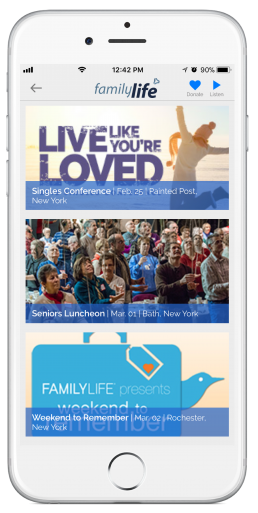 To restore the hope found in Jesus Christ, Family Life wanted its programs and shows to be also made available online through a mobile app featuring streaming music formats. In addition, to broadcast upcoming community news, events and shows to the Christian masses. Listen to podcasts covering genres such as Afternoons, Family Life Report, Got A Minute, Guest Speakers, Interviews, Kids Corner, Kingdom Bound, Mornings and Todays Partners – Listen to interesting conversations correlating day-to-day events with biblical verses. You can even celebrate your child’s birthday with a special birthday card from Flin, Family Life’s furry mascot pup! Find upcoming Christian community events such as conferences, luncheons, weekend meets, dinner, dramas, dinner theaters, comedies etc. 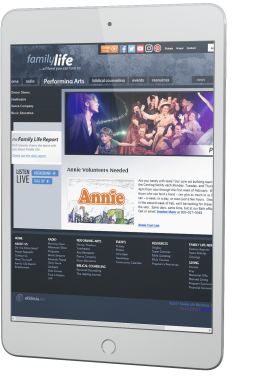 featured on the Family Life website. You can book tickets, view event photos and visuals, volunteer in community based programs and do a lot more. Gain spiritual strength by reading the verse of the day – Daily sermons narrating quotes from the Epistles.